Years ago when I first started practicing law representing victims injured in automobile accidents, the legal landscape was quite different. I remember taking an initial intake call and writing facts down on a yellow pad of paper. Then when I conducted the client interview in my office, their home, or the hospital, I wrote more facts down on paper. When it came time to request the hospital and treating doctors’ records, a written request was mailed out. When all the records came into our office, a medical file was made up with an index and medical summary to be placed in the folder. If the insurance company of the at-fault driver did not present a fair offer of settlement, a Complaint was typed, on a typewriter, it was signed, and then hand delivered and filed with the Court. Thereafter, we would navigate through the discovery process, i.e. written Interrogatories and Request for Production of documents. Once that stage was completed, depositions of all parties were taken before a Court Reporter. The Certified Court Reporter would mail the typed transcript to the parties. That’s a lot of paper for one case! Today, fortunately things are much more efficient and improved. The initial intake information is now recorded in the computer. So too, at the initial interview all additional facts are noted in the computer. Now, rather than having to hunt down and carry a heavy file, there is a paperless file in the computer with all important documents: police report, medical records, court pleadings, medical bills, etc., all at the attorneys’ fingertips to look at on the computer. I love this new era and technology! It allows me to be able to quickly access a client’s information no matter where I am physically located. I frequently receive emails from clients in the evenings or on weekends, when they are not at work. I am able to respond during off hours because of going paperless. I am able to check the paperless file on the computer, and quickly respond to a client’s question. Today there’s even an app for The Delaware Code, so the statutes are right at our fingertips. The different smartphones, tablets, and laptops available today have all changed the way attorneys can now practice law. Instead of walking over to the Courthouse with documents to file and wait to have them date stamped, all court documents are filed electronically from our desktops. If a Court docket sheet has to be accessed, we can simply go on-line and retrieve the information rather than sending someone to the Courthouse. Rather than waiting to receive a transcribed deposition of a doctor or party in the mail, those documents are now quickly available on-line and can be accessed and available for use as soon as the Court reporter has completed the transcript. So too, rather than paying to store large closed files, the important portions of the file can be scanned into our system and saved. Another new area of consideration in this paperless world is, unlike in years past, when I meet with a new client, I must caution them about the use of social media. Insurance adjusters, police agencies, and family law attorneys (to name a few groups) regularly scan sites such as Facebook, Twitter or LinkedIn to gather information on a litigant. The Delaware Rules of Professional Conduct prohibit a lawyer from altering or destroying evidence or assisting others in doing so. A lawyer or their staff cannot recommend that a client remove or delete harmful Facebook matters. A lawyer has a duty to ensure the preservation of a client’s social-network profile if the profile contains information or content relevant to a legal dispute. Before you become a litigant, and before you post any words or photographs on social media, please ask yourself if you would be OK with seeing them blown up and shown to a jury in a courtroom. Where is the practice of law going in the future? I am not sure but getting there will be greener still. Webcams and business virtual meeting programs are becoming very common. Soon client meetings, depositions and even some hearings will be remote. No car, no gas- Very Green. Like many other areas today the legal world is doing its part in “Going Green”! Susan D’Alonzo Ament is a partner with Morris James LLP and has practiced for 28 years representing personal injury victims. Over the years, Mrs. Ament has found that some women don’t understand the crucial need to have adequate automobile insurance coverage in the event of a serious accident. Susan Ament educates women on these needs every day in her practice and in seminars that she presents throughout the year. ← Previous Story Delaware Workers’ Compensation Benefits – Watch your step! 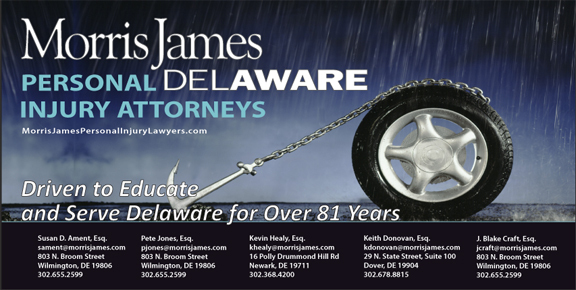 Next Story → Delaware Workers’ Compensation Benefits – How do I know if I have a work injury?